Why has rotisserie chicken become so popular? Not only do you find these golden, roasted birds sold in restaurants, but many markets have a row of them ready for you to take home and eat. Even the big warehouse stores are selling them. Why? Because they are easy, especially if you have the money and demand to buy one of those giant rotisserie ovens that can cook 50 birds at a time. There is, of course, another reason. Rotisserie chicken is fantastic if cooked properly. 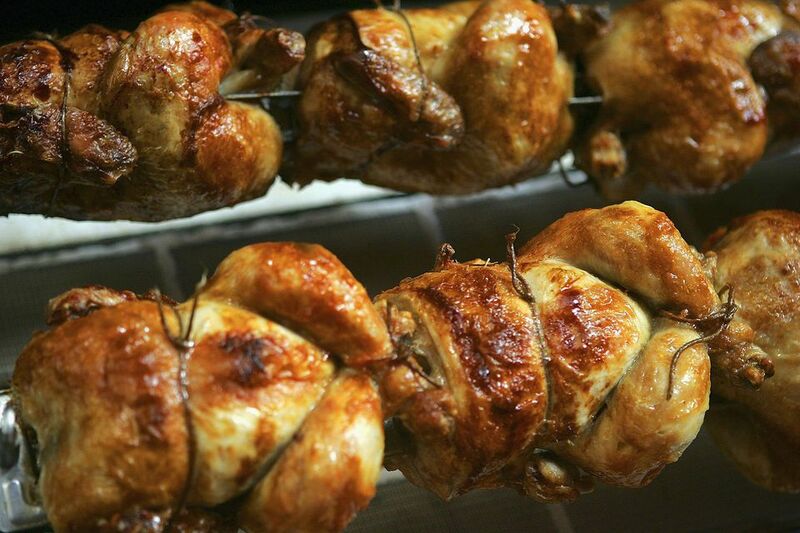 So how do you rotisserie cook a chicken properly? There are certain steps to grilling rotisserie chicken at home you'll want to follow. But first, you'll find that a few tips can make your bird as tasty as any from the store. First of all, remember that rotisserie cooking is a form of roasting. To roast something simply means putting it in the oven uncovered. Putting a bird on the grill with the lid down is roasting. What the rotisserie adds first and foremost is even cooking. Because the bird is constantly in a state rotation, it will cook more evenly. The best part of this technique is that a rotisserie chicken is self-basted. The rotation keeps juices moving around the bird, holding the moisture in place. A rotisserie chicken will be moister than one that has simply been roasted in the oven. Presumably, the final reason for the popularity of rotisserie chicken is the fat content. By placing chicken on a rotisserie spit where fat can drain away rather than in a fryer full of oil, there is a drastic reduction in fat. This results in a healthier, leaner chicken that has a great balance of lean meat to fat. It isn't dry, but it also isn't fried. The first step to rotisserie cooking a chicken is having some kind of rotisserie and knowing how to use it. This is where that user manual comes in handy. Be sure to read it carefully and that you understand the basics of the rotisserie equipment for your grill. You don't want to have something go wrong while your chicken's on the spit. It's best to start with a fresh—not frozen—whole chicken. This really does make a big difference and after that, the next thing to consider is the seasoning. Marinades, dry rubs, and bastes will all work well with rotisserie chicken. Traditionally, we think of basting meat on the spit, but that can lead to burning and requires more attention. Of course, you may still want to baste during cooking to keep the bird moist, but a good marinade will do more towards a juicy bird than applying sauces during cooking. When applying marinades or rubs to your chicken, do your best to get it under the skin and to the meat. Coating the skin will help to make it tasty, but won't do a lot for the meat underneath. With these simple tips, you're ready to fire up the grill. Enjoy this experience and it will make the chicken taste that much better.